The Homer trail is located in the Klondike Bluffs Area north of Moab, Utah. The Klondike Bluffs are a very popular mountain bike area with over a dozen trails of varying difficulties. While mountain bikers make up the majority of visitors the trails are also great for hiking and trail running. The Klondike Bluffs are famous for their dinosaur tracks with the Copper Ridge Dinosaur Trackway and the Dinosaur Stomping Ground being the two most prominent sites. This post begins at the Copper Ridge trailhead and climbs the Homer trail to its junction with the Alaska trail where we turn around and retrace our steps back to the trailhead. 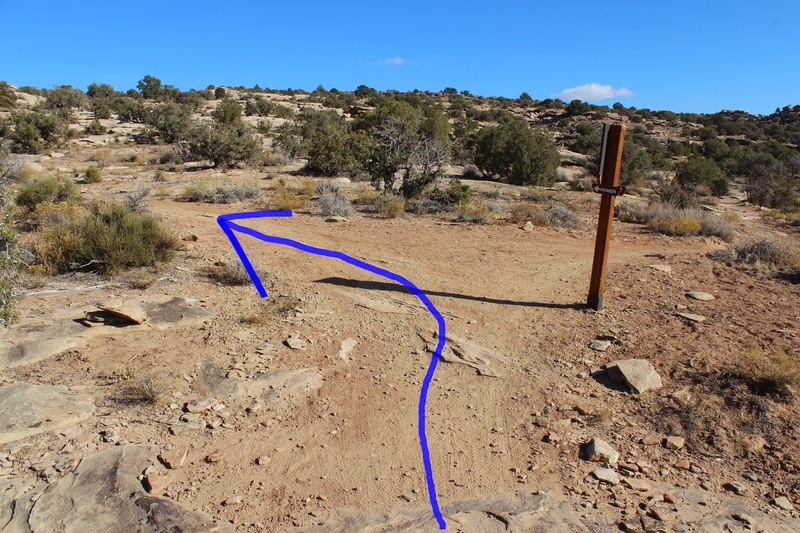 To get to the trailhead either drive 23 miles north of Moab or about 9 miles south from Crescent Junction on Highway 191 and turn east at the North Klondike Bluffs sign. Follow the dirt road for about 1 mile to a fork. Stay to the left at the fork and continue to the Copper Ridge trailhead. The road is easily passable for passenger vehicles when it is dry but after a hard rain it can be difficult in places for any vehicle. The Homer trail begins about 500 feet down the Dino-Flow trail. 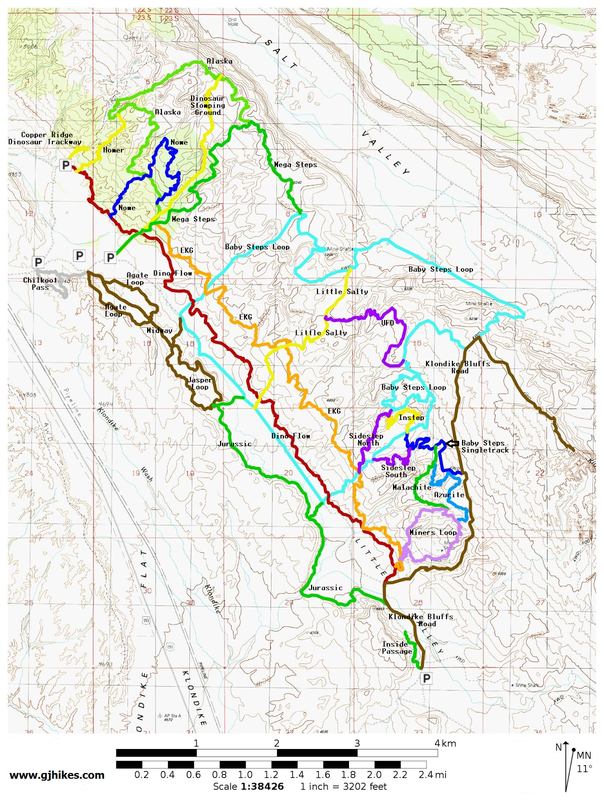 The Klondike Bluffs trails are color coded with yellow being the color of choice for the Homer trail. From the very start the Homer trail begins climbing the slickrock ridge. The average grade for the trail is 7 percent. 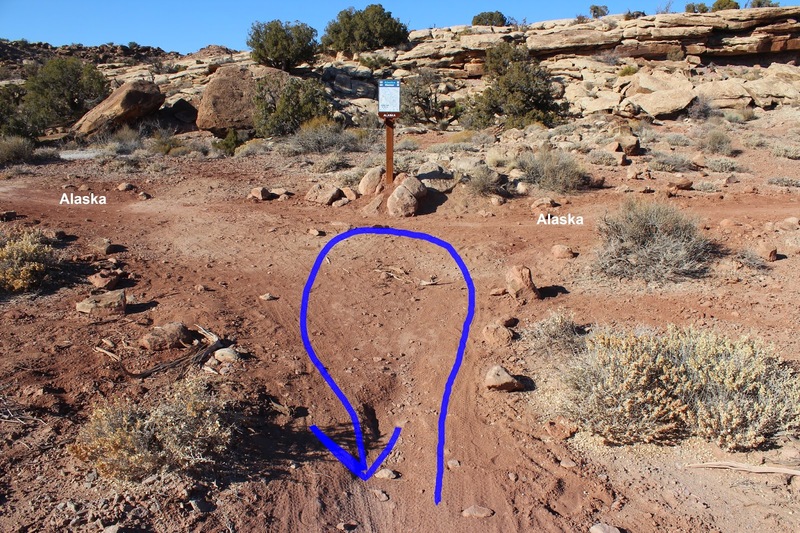 Like most of the trails in the Klondike Bluffs area there are hidden valleys after the initial climb where the slickrock eventually gives way to dirt. The trail continues to climb encountering occasional slickrock patches and rock ledges. At about 9 tenths of a mile from the trailhead the Homer trail comes to an end at its junction with the Alaska trail. From here there are several options. The left fork follows the Alaska trail the rest of the way up the ridge where it eventually comes to an end at its junction with the Mega Steps trail. The right fork also meets up with the Mega Steps trail but closer to the bottom of the hill. Along that route the Alaska trail junctions twice with the Nome trail. For this post we simply turned around and hiked back down the hill. The road that passes through the Copper Ridge Dinosaur Trackway can be seen from the Homer trail. When we completed the Homer trail for this post we hiked it. We had already rode the Dino-Flow and EKG trails earlier in the day and we were feeling a need to get off our bikes for awhile. We have both been to Homer, Alaska and the resemblance is nothing like the trail in the Klondike Bluffs. We have also been to the Klondike region of the Yukon in north-western Canada and as you can imagine it doesn't resemble the Utah desert either. We figure this area got its name from the rush of miners that left their mark on the bluffs digging for copper. Semantics aside, this is a great place to play anytime of the year. If you would like to see it for yourself then all you have to do is grab your bike or 'Take a hike'.